The unique algorithm carves out important signal features making sounds sound more like themselves and is operated with essentially one control. Between the proprietary algorithm and an optional soft-knee saturating limiter in the plugin’s output stage, INTENSITY also excels at attaining maximum loudness and creating a beautifully aggressive tone. INTENSITY is equally suited for processing individual tracks like speech, SFX, instruments including guitars, bass and piano as well as full mixes, multi-channel film stems, drum busses, and other complex content. 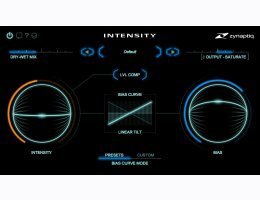 This makes INTENSITY an indispensable tool for music producers, mastering engineers, sound designers, video producers, broad/podcasters, forensics professionals, audiophiles, or virtually anyone to quickly and easily add clarity, definition, and perceived loudness to their audio projects. INTENSITY supports all common sampling rates from 44.1kHz to 192kHz depending on available CPU resources, mono, stereo, and multi-mono operation, as AAX native, AU, RTAS, VST 2.4 and VST 3, on Mac & Windows.